One of the most exciting and beautiful moments of your life includes becoming parents. When you hear the first cry of your baby, you know you’ve created a life and that this life is your responsibility. The time when your precious one grabs your finger tightly is the exact moment when you get an inner voice telling that this little fist grabbing your finger belongs to a person who trusts you and depends on you for everything. And when your little one sleeps on your lap… the moment is undefinable. Won’t you wish to learn a few easy ways to make your baby sleep? Becoming a parent is confusing and daunting. With all sort of not so useful leftover coming from effects people, a green parent isn’t sure of what practices one must apply for the baby to stay healthy. A major question that arises while taking care of this new life, revolves around diet and food. Babies are delicate and thus one has to be extremely careful about what he/she. 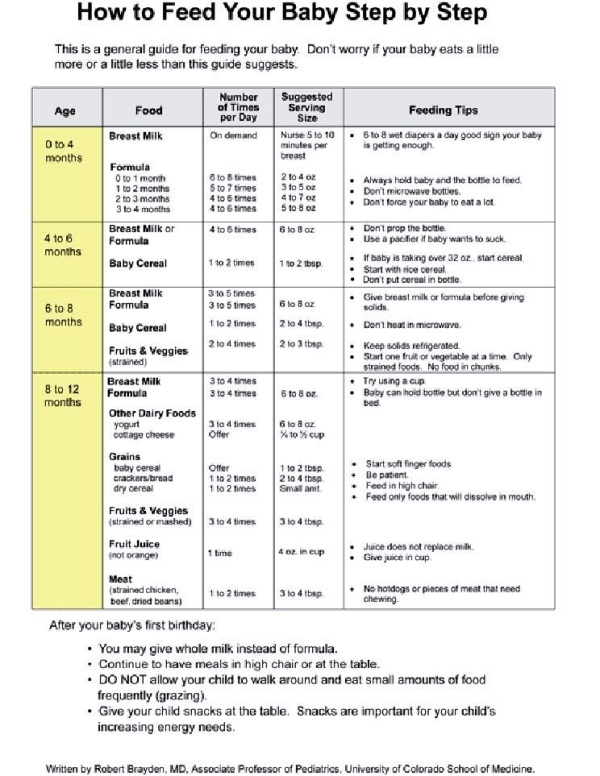 Any new caretaker of a baby would desperately look for an Infant Baby Feeding Chart Schedule and Guide to feed his/her little munchkin in the most correct way possible. Good food is vital for good health. So, one of the most important roles as parents is to give children a variety of food that helps them grow up healthy. We understand your troubles completely and so we’ve brought exactly what you need to read. 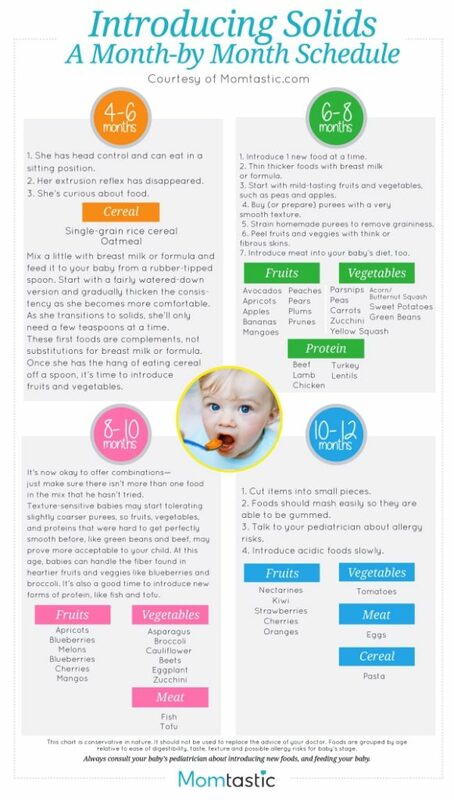 This blog, named ‘Infant baby-feeding chart, schedule and guide’, is something that you will want to follow to keep your infant (birth- 12 months) healthy and smiling. Wondering why milk is so important for babies? Well, you’ve landed in the right place. A baby needs only milk as food and drink for the first six months. Also, milk is very important part of a baby’s diet, at least for 1 year. The best milk for baby is breastmilk, which contains each and every required nutrients and antibodies. But, aren’t there situations when one cannot breast feed the baby? 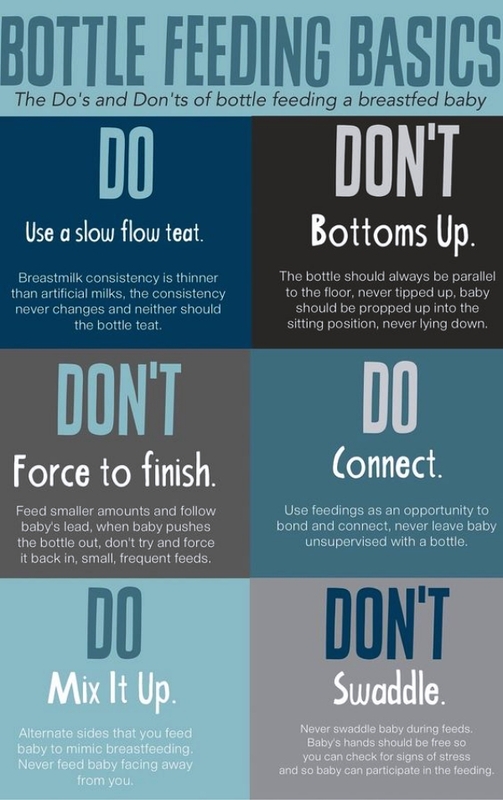 Formula milk is your solution to look for. Other milks like, soya-based infant formula, goat’s milk and cow’s milk are heavy to digest and so can be introduced only when the baby is 12 months of age. Solid-feeding your baby, remarks a new chapter in your baby’s life. You can start it once your little one is 6 months of age. However, you can even start it prior to 6 months. But, then don’t forget to consult a pediatrician first. Smooth baby rice or vegetable puree, are the best options to start with weaning. You 4 months old baby has a delicate digestive tract. So, the food and drink of their diet is milk. Yes! The best milk they can have is breastmilk. If not for breastmilk, Formula milk comes to the rescue. Formula milk is formed by powered cow’s milk, which is modified to contain the same contents as that of breast milk and is fortified with necessary vitamins and minerals. But, researchers have proven that breast fed babies have an advantage over formula milk fed babies. Further, you might even think of feeding them with soilds. But, a careful inquiry must be done with a pediatrician before stepping towards solid feeding at this stage, as the baby might not be strong enough to take in solid food. Yay! Your baby can have their first solid servings now. However, digestive tracts are still delicate. So, they must be fed with soft purees of various ingredients. The preparation of purees must be done with utmost concentration, as hard food might affect the baby’s health. If you’re thinking of cooking for your baby, have a look here: butternut squash puree, root vegetable harvest, broccoli and potato puree, squash and lentil bake, chicken chowder, sweet potato and apple puree, apple and pear duet as well as apricot and millet fool. Cow’s milk has proteins that are too hard for the baby to digest and so cannot be fed to a 6 months old baby. Even edibles like eggs, fast food, gums, fruit juices, carrot, beet, spinach, hot dogs, chips, etc., might be harsh for the baby. How great of a bliss is it, to see this lovely tiny human being cutting teeth for the first time? A lot. Right? But, this might be somewhat tiresome. As, the baby might be experiencing some different affects of cutting teeth, like fever and diarrhoea. So, it’s very necessary to feed the right kind of food. Baby food available in the market can be brought home now. Also, right way of storage is necessary. Any left over food, exposed to air for long, isn’t fit for your baby to eat after storage. You can now introduce fruit juice to your baby. (Note: Offer juice through a cup, as drinking from bottle might cause the juice to stick with the teeth for long and thus, resulting in cavities.) Your baby can nibble on more solid stuff now. This is also the time when you observe your baby for any kind of allergy or hypersensitivity towards a particular kind of food. Peanut sensitivity is very common amongst babies. You can feed the baby when these dishes- peach and apple fool, pumpkin pilaf, creamy vegetable pasta, etc. 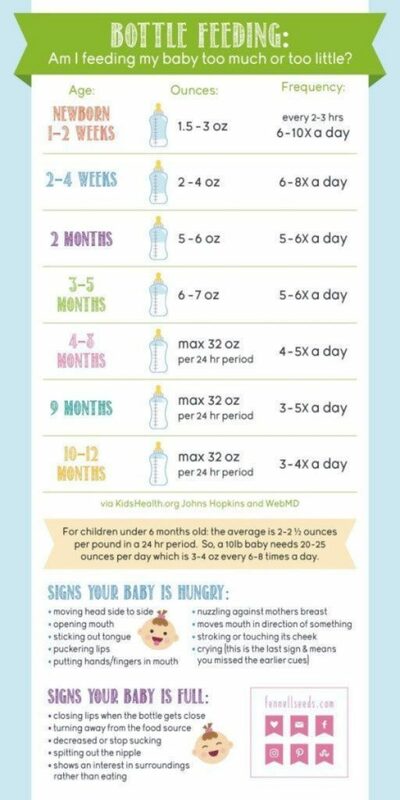 How many ounces should a baby eat chart? Don’t know how often should you feed your baby? The answer is right here. 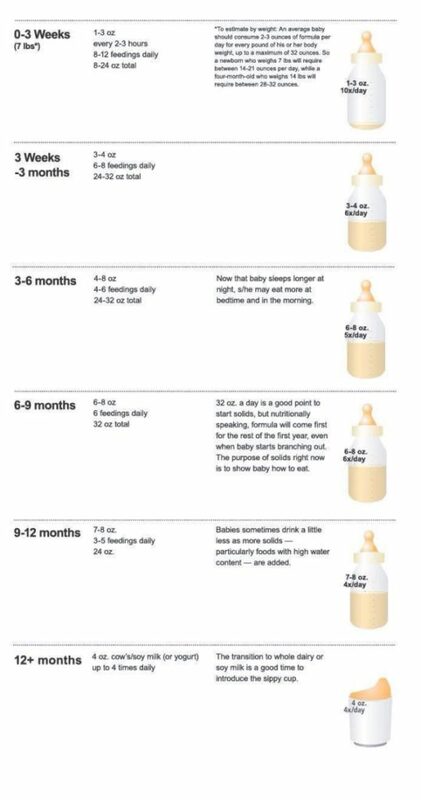 Initially when the baby is of 1 month or so, 1-2 ounces are sufficient. You’ll have to increase the amount of ounces given with every month. Babies are hungry all the time. Feeding 3-4 times a day will keep your little one healthy. How long should a baby breastfeed per session? How often do babies breastfeed by age? For a first time mother, breastfeeding can be a tough task to carry on. But, 20-45 minutes of breastfeeding is sufficient, till the baby is asleep. Breastfeeding is the most beautiful experience you’ll ever get. 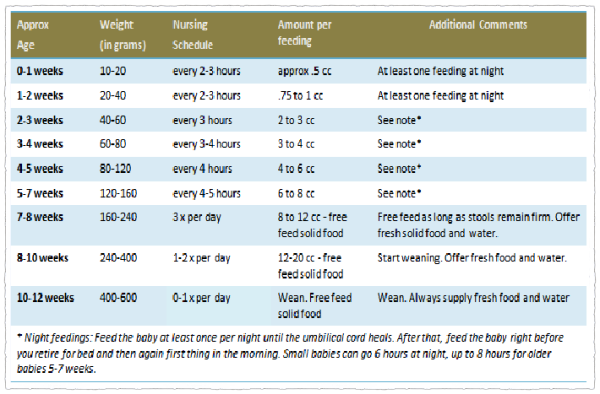 For 1-2 months old infants, 7-9 times feedings for a day is sufficient. WHO and UNICEF recommends a mother to carry on breastfeeding for at least two years. Though, it is negotiable. 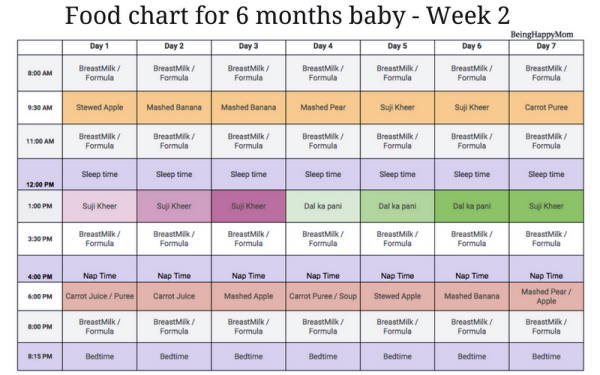 Now, you’ve all the basic information and Infant Baby Feeding Chart Schedule and Guide that you will surely need to feed your baby. We know this tiny human is your world, but also let him/her explore a world of his/her own. As parents your concern mustn’t ever kill them growing and learning something new. May your baby be healthy and happy always. May this journey of yours with your small packet of happiness be the best. All the best with your parenthood.